The concept of compounding works for investing – in both your finances and your sales career. 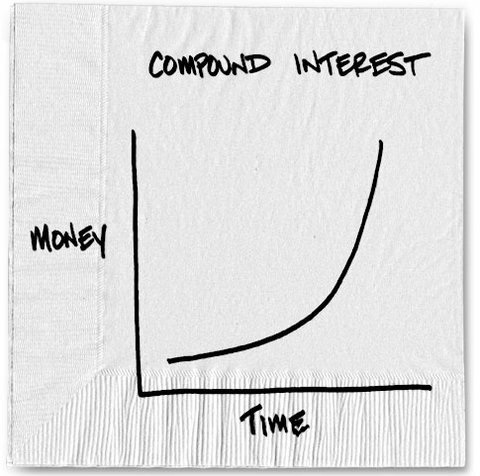 Most everyone understands the power of compounding. In a nutshell, small increases in anything multiplied by more small increases over a long period of time produces a hockey stick curve of massive increases. Compounding can produce powerful increases in your sales results too. That is, small improvements in your selling skills from sales training and equally small increases in your activity levels can produce massive increases in overall sales. Let’s take a look below at the different stages of a sale for a typical salesperson who we will call Kevin Kloser. Like many salespeople, Kevin makes outbound prospecting calls and attempts to connect with decision makers. 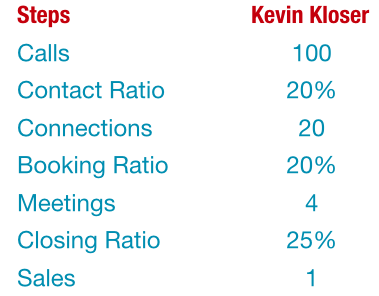 In this case he makes 100 calls (and/or emails) monthly and, on average, ends up connecting to 20 prospects equaling a 20% contact ratio. Out of the 20 conversations, he generates enough interest for 4 of the conversations to lead to meetings – a 20% booking ratio. Finally, with a closing rate of 25%, 1 out of 4 meetings results in a sale. This example is a 4 step funnel, meaning there are 4 distinct steps between first contact attempt and conclusion of the first sale. You may have more or fewer stages in your selling process but the concept remains the same regardless. Now, let’s see what happens when Kevin does some good sales training (and more importantly implements it). Kevin learns how to leave better voicemails and uses other powerful strategies to increase his connection rate from 20% to 24% immediately. This results in connections to almost 9 more people. He learns how to engage the customer on the phone in such a way that they want to learn more about his product or service and bumps up the number of meetings booked by 20% which now equals almost 7 when combined with his higher contact ratio. When in “discovery” meetings, he gets better at uncovering the customer’s true issues, challenges and problems and is able to connect his solutions to these in a compelling way. This causes his closing ratio to increase from 25% to 30%. With some fresh and proven ideas, increases of 20% in these skill areas are very realistic. It’s not uncommon frankly for salespeople who apply themselves to become 100% better in these areas! In addition to growing his skills, Kevin also learns how to manage his time better so he can make 20% more contact attempts through phone calls, emails or social selling platforms. 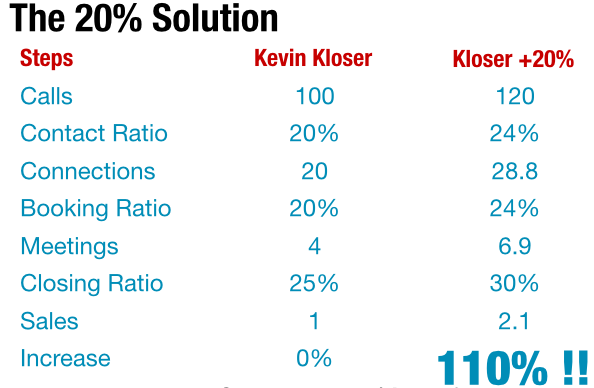 The “Kloser + 20%” column below illustrates what happens to Kevin’s sales results. Incredibly, he has more than doubled his sales!